The caterpillar of the wax moth is excellent food for reptiles, birds, amphibians and fish. Wax moths are easy to digest and are protein- and energy rich. They have low chitin content and are therefore better to digest. These insect larva's are also very popular fish-bait. Among sport fishermen the wax moth caterpillar is known under the name ‘bee-larva’. The larva owes this name to the fact that they live from honey and wax. 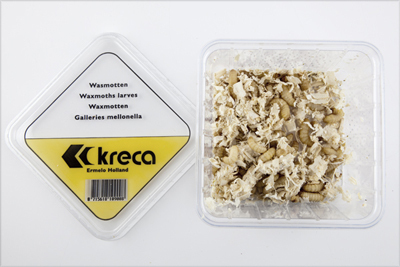 Wax moths without fodder are purchased and are more expensive due to a special rearing process. These wax moths pupate less fast because they are placed on sawdust en are more difficult to feed. Wax moths in fodder are from our own rearing and are enclosed in the supplied breeding-ground. This may make feeding slightly more complicated. By placing the wax moths – before feeding in a slightly warmer place, they will crawl out of the breeding-ground. 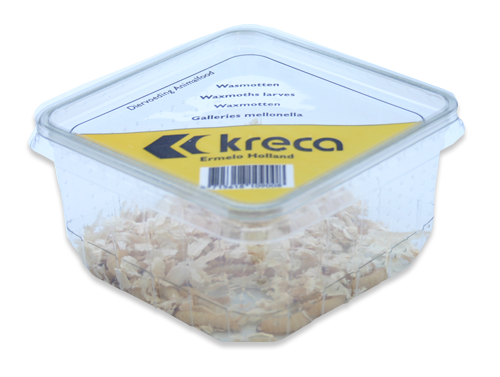 Waxmoths can be kept in the provided packaging. Between 10 and 15 degrees and it is important to keep them out of direct sunlight! It is very important to monitor the temperature! Is it too high then there’s the risk of overheating in the feeding-ground. The rise in temperature will make the wax moths crawl to the surface. If they get too warm (and too damp caused by condensation), they will die. Higher temperatures will make them more active resulting in gnawed at container lids and attempts to escape! You can add a piece of bread soaked in honey for extra nourishment. We have developed a saving system for private individuals which enables you to accumulate discount on any future orders, called eCredits. You will receive 1 credit for every euro spend, when paying with Ideal. Every credit has a value of 0,05 eurocent. Find out more about eCredits. 15-10-2018: We decided to change the terms of the eCredit saving program. Business relation cannot save eCredits anylonger. eCredits that have been saved in the past will remain exchangeable as long as they are valid.